The largest network of the food and coffee industry in Greece! To become a superhero in your own and your family’s eyes, you don’t need a cape. What you need is confidence, decisiveness and ambition. And a team of people who are always by your side. You need your own Gregory’s. The confidence provided by the largest coffee and fast food network in Greece and the 8th biggest in Europe can be the solid foundation for your dreams and help you become a real-life hero to those you love. 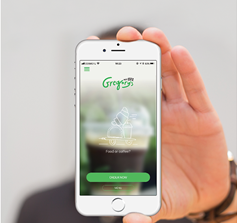 And this is not a reckless claim: it is borne out by our 47 years of experience, our more than 330 stores in Greece, Cyprus, Germany and Romania, and the 250,000 customers who choose Gregory’s every day. The impressive numbers are certainly proof enough, but they need to be complemented by something much more important: the human factor. Each Gregory’s store is a unique business, which has our constant support. Its performance, employment conditions and profitability continually improve. It is a business that combines profit and professional satisfaction. And these are not just empty words: in 2009 the company was voted Best Franchise Workplace and in 2008 the network with the Best Internal Organisation, while the company’s CEO, Vlassis Georgatos, was voted twice, in 2010 and 2015, as Best Franchise Leader. In other words, this success is not purely coincidental. So, that makes the investment a true success! If you want to work with us and become a member of the Gregory's family, fill in the form below or contact us at 210 99 71 100. We will be glad to meet you!